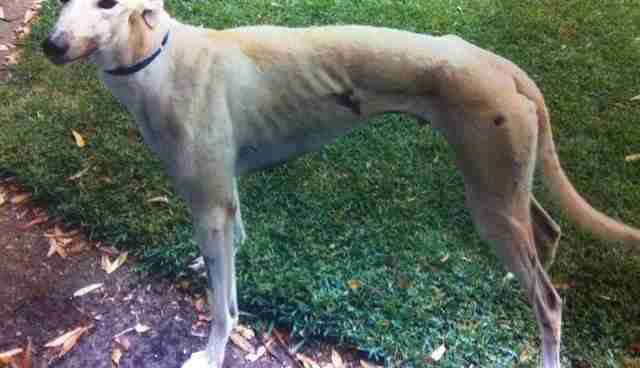 The greyhound spent six months at the Animal Welfare League before being adopted. While shelter workers tried their best to care for him, he lived in a constant state of stress, causing him to lose about 22 pounds. He also developed pressure sores from lying on a concrete floor, and had to get a few broken teeth removed because he spent so much time chewing on his kennel. 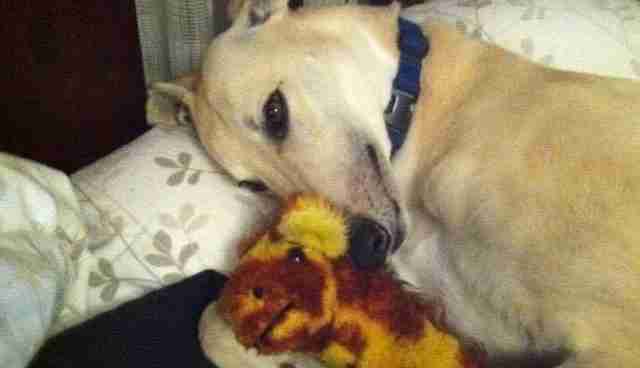 When Joanne first met the greyhound, whom she named Fastfeet, in 2011, she knew she wanted to adopt him. "I could see what an awesome dog he was," she tells The Dodo. "He just needed to learn how to be a pet and not a race dog." 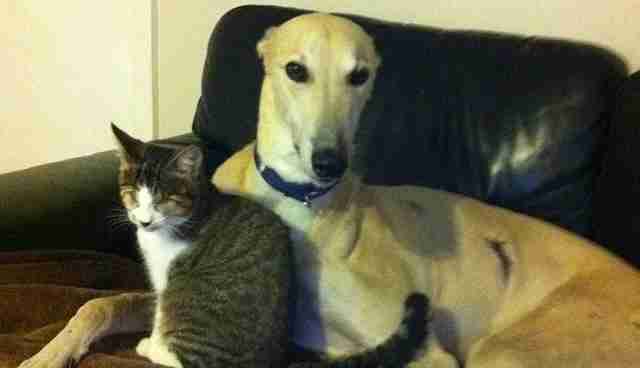 What Joanne didn't know, however, was how this greyhound would behave around other animals. 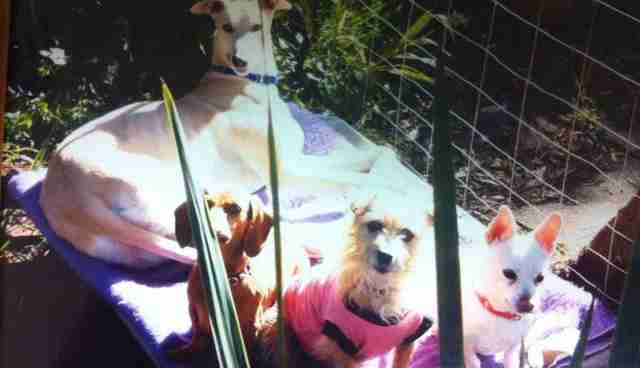 Joanne had three dogs and three cats, and also fostered animals for CatRescue901, a rescue group run by Jenny Storaker. While greyhounds are gentle, amiable creatures, people involved in the greyhound racing industry in Australia have been known to use a gruesome practice called "live baiting" or "blooding" to train their dogs to run. Last year, an undercover investigation revealed that trainers routinely attach possums, kittens, piglets and rabbits to mechanical lures, and catapult them around the racetrack. 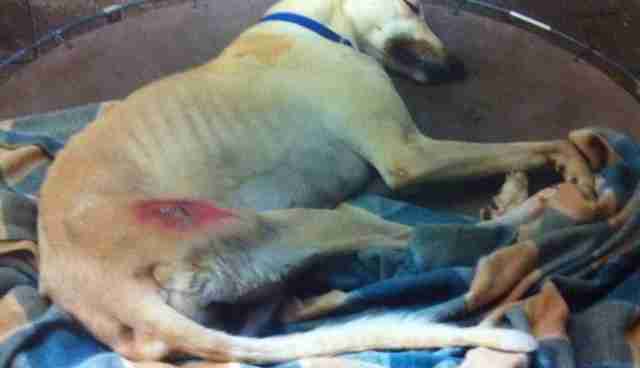 The greyhounds are prompted to chase the animals and eventually kill them. Baiting has actually been illegal in Australia for decades, but it's believed that the majority of trainers use this technique. Stephen Rushton, a barrister working on an official inquiry into the industry, reported to The Guardian that he anticipated evidence showing that 90 percent of the industry not only knew about live baiting, but engaged in it. Some trainers who've used this barbaric practice have been sentenced to prison. With this in mind, Joanne knew she needed to take plenty of precautions with Fastfeet around her other animals. When she first introduced Fastfeet to her other dogs, she kept a muzzle on him, only taking it off 12 months later when Fastfeet began to act calmly around the dogs. She knew she could trust him completely. Now the dogs get along so well, they share each other's beds. For a long time, Joanne kept the cats in a separate part of the house, and didn't think of introducing them to Fastfeet. But after seeing how well Fastfeet started getting along with the dogs, she decided to try. "I just let one of my cats out so he could see her, and I could see Fastfeet's reaction," Joanne tells The Dodo. "He had his muzzle on and a lead, and I sat with him on the lounge. As soon as he saw the cat, he wanted to chase her. I don't know if he would have hurt her, but he definitely showed too much interest in her." 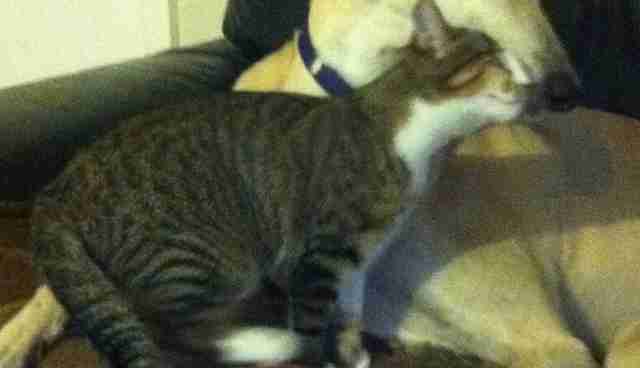 Joanne began a long process of desensitizing Fastfeet to the cats, which took nearly a year. 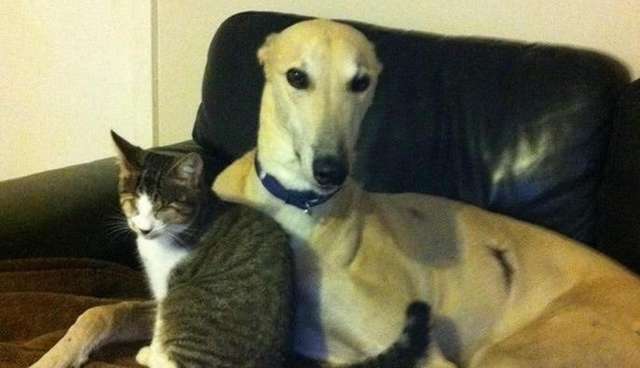 After a series of brief, supervised meetings between Fastfeet and the cats (during which Fastfeet was always muzzled), Joanne eventually allowed the cats to get close to the greyhound. The initial encounter went so well, Joanne wondered if she had anything to worry about in the first place. Fastfeet was extremely gentle with the cats, and eventually let them crawl all over him and cuddle. 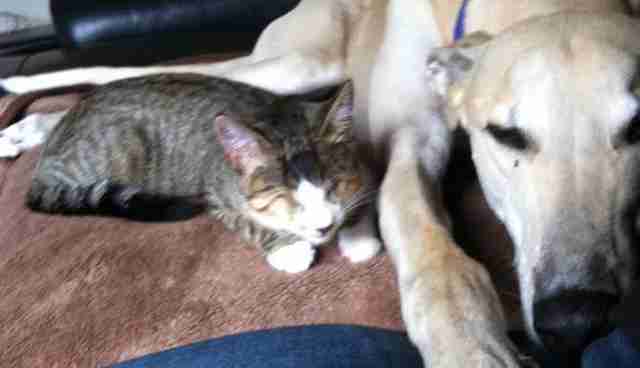 But it was one cat in particular - a foster cat named Indi - who made Fastfeet fall in love. Indi had been rescued by CatRescue901 after being found wandering the streets of Sydney with a bad case of cat flu. She'd developed such a bad infection from the flu that both of her eyes had to be removed. When Joanne first brought Indi home, she kept her isolated in a room by herself while Indi recovered from her operation. But when Fastfeet snuck into Indi's room while Joanne was cleaning, the two animals formed an instant bond. They ended up spending nearly the entire day together, and every day after that. They slept together, cuddled together and played together. When Joanne put a harness on Indi to take her outside, Indi would wander around the garden with Fastfeet, and lay with him in the sun. When Indi got scared by the car noises, she ran to Fastfeet for protection. When it came time for Indi to be adopted by a new family, Joanne knew Fastfeet would miss her dearly. But Fastfeet's love for cats didn't stop at Indi - he's formed a bond with every foster cat who comes into Joanne's house. "He just wants to be in the rom with them," Joanne says. 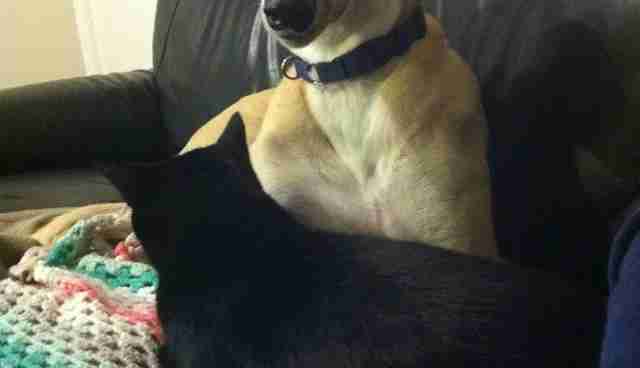 "He sits on his blanket and the cats crawl all over him. He even grooms them. I'm starting to think he believes he's a cat." Fastfeet is also very protective of the foster cats when other people come to see them. "Whenever people come to meet the cats, he always knows and wants to be part of the meet and greet," Joanne says. "If he's not in the room, he sulks and cries at the door." Joanne hopes Fastfeet's story will inspire others to adopt ex-racing greyhounds - across the world, as racing is still unfortunately a major industry in the U.S. as well as Australia. According to the Minnesota Greyhound Rescue, between 3,000 and 9,000 greyhounds are killed each year in the U.S. alone. (An exact number isn't known as several states don't keep records.) "Adopting Fastfeet is the best thing I've ever done," Joanne says, "and I can't imagine this house without him." 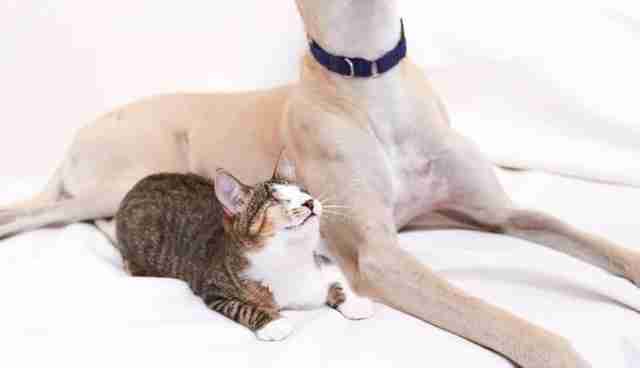 For more information about the greyhound racing industry, or to adopt a greyhound yourself, check out the National Greyhound Adoption Program and The Greyhound Project. To help cats like Indi find their forever homes, please consider supporting CatRescue901.